Eight-Minute Empire is the very definition of deceptively simple. What I’m about to tell you might make it sound too simple — simplistic, even — but I can assure you it’s not. Anything but. While it’s still firmly seated in the “light” category, it also goes a few feet deeper than you’d think at first glance, and much of that depth comes from the way it subtly pits its players against one another. As the game begins, each player has 14 army cubes and 3 city discs. Three of those armies are placed on the central region, which is completely safe: proximity doesn’t automatically infer conflict in this game, and there are no direct battle mechanics as such. In addition to these pieces, players are also given a limited supply of gold tokens based on how many players there are in the game. This is all the gold a player will ever have, and while it’s precious in the sense that it determines what range of options you can take on your turn, there’s no bonus for having any left over at the end, so you may as well spend it. Your first opportunity is a quick bid to determine who goes first. Once that’s out of the way, the game begins. The turns are quick and easy: just buy a card from the offer next to the board and resolve it. Once everyone has resolved a set number of cards (once again, the number is dependent upon how many people you have in the game), the game is over and you tally up how many victory points you’ve earned from the regions, continents, and goods you’ve acquired. Counting up goods totals at the end of the game (8 points). First, there’s a lot to consider on each card. The symbols along the bottom indicate what that card lets you do, from recruiting new armies into the starting region, to moving them around (or special movement cards for sailing them across the sea), building cities to create new recruiting spots, and the occasional opportunity to remove an enemy army from the board. These are hardly equal, especially as various demands arise — cities don’t do you much good on the first turn, movement cards always seem to pop up when you need more troops, and recruitment is pointless once you have enough armies running around. To make matters even trickier, the price of purchasing these cards is determined by how long that card has gone unused, the first card always free and the price gradually increasing to a whopping three coins for the one most recently drawn (you can see the reference along the top of the board). 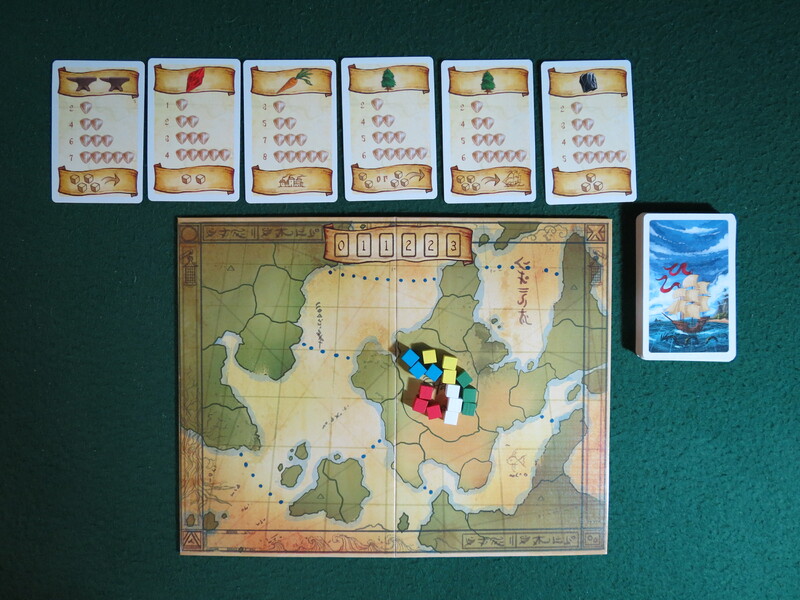 And one of the surest ways to make an enemy is by nabbing that sailing card right out from under the nose of your buddy who’s been complaining for three rounds about how he needs to get across the ocean. 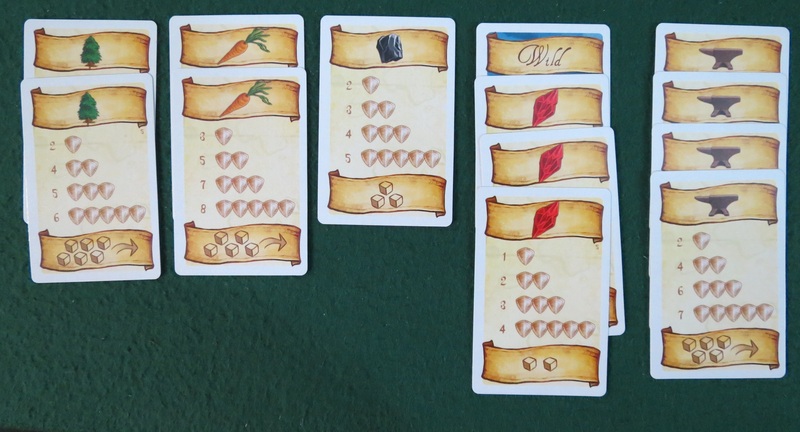 Second, each card also sports one of five “goods” at the top: carrots, iron, trees, coal, and gems. In addition to the regions and continents you control, these can add a princely sum to your victory points at the end of the game, especially if you’ve gathered a tidy set of them. Naturally, it’s rare for your desired goods to match up with the actions you need, so choosing cards soon becomes a balancing act between picking up those that are lucrative and those that are useful. Third, for a game that contains no direct combat, there are plenty of ways for players to screw each other over. Maybe you’ll use one of the rare army-killing cards to wipe out the lone pilgrim-cube your opponent painstakingly moved over to another continent to eventually colonize a city. Or maybe you’ll see that she’s about to win control of the continent and start moving your armies to match her numbers, thus depriving her of land while likely granting you a victory thanks to the goods on your cards. 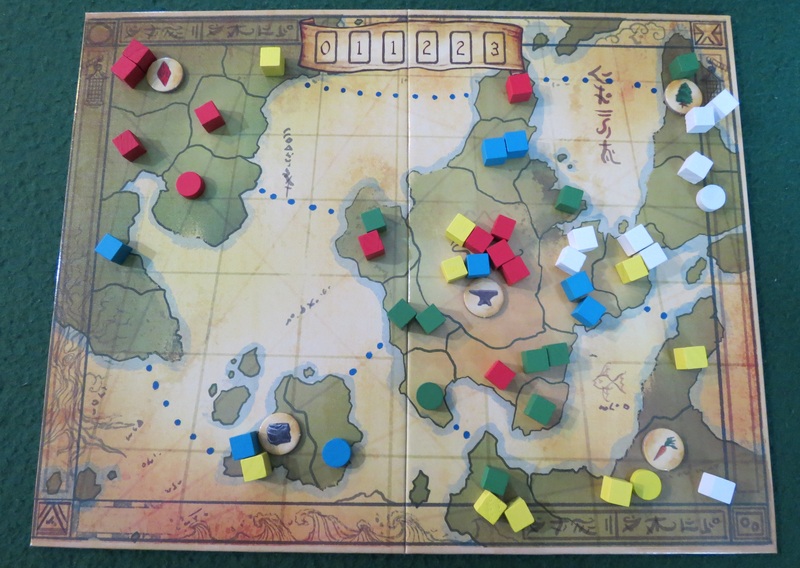 Things become especially nasty if you’re playing with the Goods Tokens Variant (you should), which places bonus goods at the hardest locations to control: the four corners of the world and right back at the starting space, which is practically always covered with surplus cubes. This injects a bit of random spice to the game, gives everyone a reason to expand farther than they normally would for the treasures these remote locations now contain, and creates a bunch of flashpoints to compete over. The end of a 5-player game with the Goods Tokens variant. Well, it naturally depends. With two players, I can see it only taking the titular eight minutes to finish a game. With more, it might stretch out to around twenty. Even so, that’s darn fast, and combined with its surprising depth and “just one more quick game!” appeal, this is one of the best filler games I’ve seen come out this year. So good, in fact, that a few members of my gaming group were hoping this would be the evening’s main course rather than just the appetizer. And when we have giants like Kemet, Space Cadets, and Core Worlds lined up to play, that’s a really, really good sign. 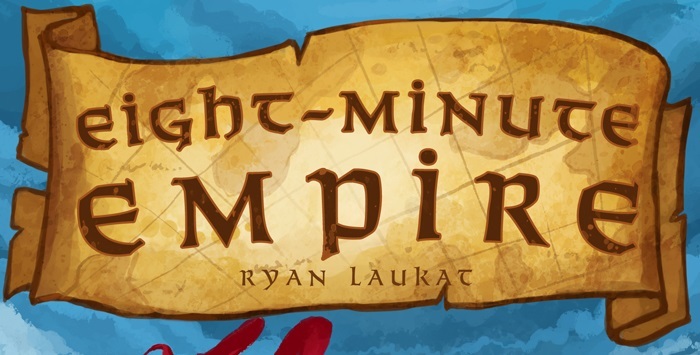 Posted on April 23, 2013, in Board Game and tagged Board Games, Eight-Minute Empire, Red Raven Games, Ryan Laukat, The Fruits of Kickstarter. Bookmark the permalink. 12 Comments. The merger of simple play and a fairly wide range of possible actions reminded me a little of your own designs, actually. Rules can be found here. They don’t cover the Goods Tokens Variant, but otherwise look the same as those in the finished game. Pingback: Eight-to-Twenty-Minute Legend | SPACE-BIFF!